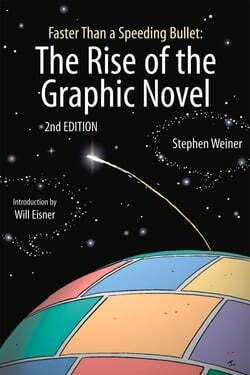 Graphic novels have exploded off bookstore shelves into movies, college courses, and the "New York Times "book review, and comics historian and children's literature specialist Stephen Weiner explains the phenomenon in this groundbreaking book--the first history of graphic novels. From the agonizing... read more Holocaust vision of Art Spiegelman's "Maus" to the teenage angst of Dan Clowes's "Ghost World," this study enters the heart of the graphic novel revolution. The complete history of this popular format is explained, from the first modern, urban autobiographical graphic novel, Will Eisner's "A Contract with God," to the dark mysteries of Neil Gaiman's "Sandman," the postmodern superheroics of Frank Miller's "Batman: The Dark Knight," and breakout books such as Alison Bechdel's "Fun Home" and R. Crumb's "The Book of Genesis." It's all here in this newly updated edition, which contains the must-reads, the milestones, the most recent developments, and what to look for in the future of this exciting medium.